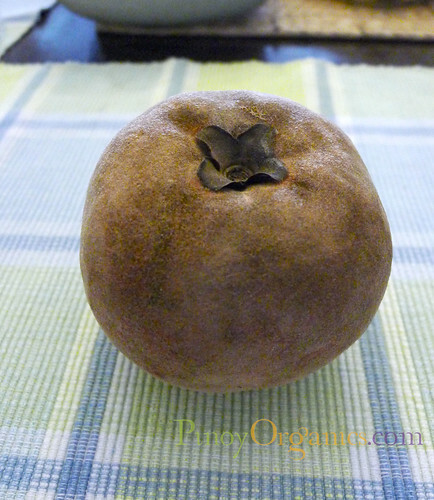 Mabolo or Velvet Apple is an edible fruit with a fine, velvety fur and reddish-brown skin. Its flesh is soft, creamy, with a taste and aroma comparable to fruit cream cheese. More admired for its ornamental than its edible value, the mabolo has appeared in literature for many years under the illegitimate binomial Diospyros discolor Willd. 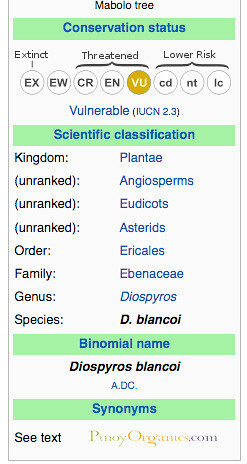 In 1968, Dr. Richard Howard, Director of the Arnold Arboretum, Harvard University, proposed the adoption of D. blancoi A. DC., and this is now regarded as the correct botanical designation for this species. The fruit is called peach bloom in India and buah mantega (butter fruit) in Malaysia – a term now often applied to the avocado–, or buah sakhlat, or sagalat (scarlet fruit). Mabolo (or mabulo) is the most common of the several Philippine dialectal names. Kamagong usually refers to the entire tree, and mabolo is applied to the fruit. The mabolo is indigenous to the low and medium altitude forests of the Philippine Islands, from the island of Luzon to the southernmost of the Sulu Islands, and is commonly cultivated for its fruit and even more as a shade tree for roadsides. The tree was introduced into Indonesia and Malaysia, and, in 1881, into Calcutta and the Botanical Garden in Singapore, though it existed in Singapore before that date. In recent times, it has been decreasing in numbers in Malaysia. It is only occasionally planted in India and then mainly as an ornamental because of the attractiveness of the foliage and the fruits. Seeds were sent to the United States Department of Agriculture by W.S. Lyon, of the Philippine Bureau of Agriculture, in 1906, with a note of admiration for the tree and the exterior of the fruit but not the interior; still, more seeds were sent in 1909 and the seedlings thrived at the Plant Introduction Station in Miami. There are occasional specimens grown elsewhere in southern Florida and some scattered around the Caribbean area, in Jamaica, Puerto Rico, Cuba, Trinidad and the Lancetilla Experimental Garden in Honduras where plants were received from the Philippines in 1926 and seeds from Cuba in 1927. There are a few in Bermuda and in Hawaii where the mabolo first fruited in 1928. Male trees must be planted near the female trees for effective pollination and fruit production. The tree does best in loam but flourishes very well in almost any soil with little care. It is rarely fertilized and seems to need no protective spraying. 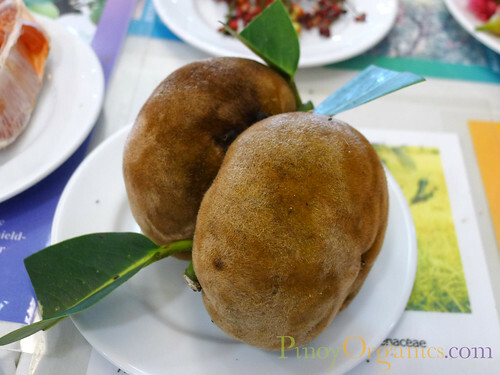 Mabolo is easy to grow organically and we hope that this fruit will gain popularity again. Its current conservation status is ‘vulnerable’ and we hope farmers will continue to plant more mabolo trees for the next generation. In the Philippines, the main season is June until September but occasional fruits may be found on the tree at almost any time of the year. The surface fuzz adheres tightly even when the fruit is ripe. Also, the skin, though thin and pliable, is tough and papery when chewed. Therefore, the fruit should be peeled before eating, and then kept in the refrigerator for a few hours before serving. Then the odor, which is mainly in the skin, will have largely dissipated. Some people slice or quarter the flesh, season with lime or lemon juice or syrup and serve fresh as dessert. The flesh is also diced and combined with that of other fruits in salads. If stewed in syrup, the flesh becomes fibrous and tough. Cut into strips and fried in butter, it is crisp and fairly agreeable as a vegetable of the dasheen or taro type appropriate for serving with ham, sausage or other spicy meat. The fruit is considered a fairly good source of iron, calcium and a good source of vitamin B. 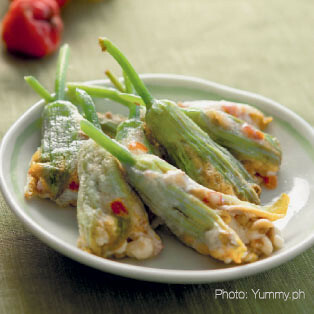 We chanced upon this interesting use of mabolo as an appetizer. We will definitely try the recipe in the near future. Can you share another recipe using mabolo as one of the ingredients? 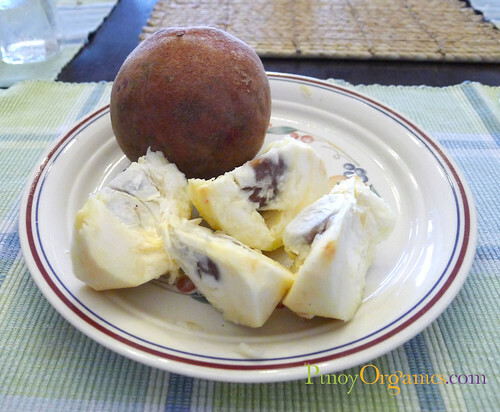 NOTE: THIS ARTICLE IS PART OF OUR SPECIAL SERIES ON RARE PHILIPPINE FRUITS. For 35 years of existing, I came to know mabolo when colleague brought some in the office. I touched, smell and tasted. Wow, I like it very much. I used to eat mabolo when I was a kid during its season…I often see it every year. When I am traveling to provinces I always see it by the roadside…I recognize it because of the velvet fruit….the funny thing is that just a few months ago that I have learned that the tree is Kamagong….after 38 years! I love the fruit, the unique buttery taste and the smell…the uniqueness of the smell….like durian. I found a Velvet Apple / Mabolo tree here on Merritt Island, Florida. It had frozen back in the freezes we had here in 2009 and 2010. At that time we got to 27 degrees F or maybe 26 where this tree was. The tree has a 4 inch diameter trunk and was fruiting. I got some fruit and am trying to sprout the seeds and have 10 pots set up. I did soak the seeds with some Organic liquid fertilizer before potting. Hoping for the best.